Happy Easter everybody! 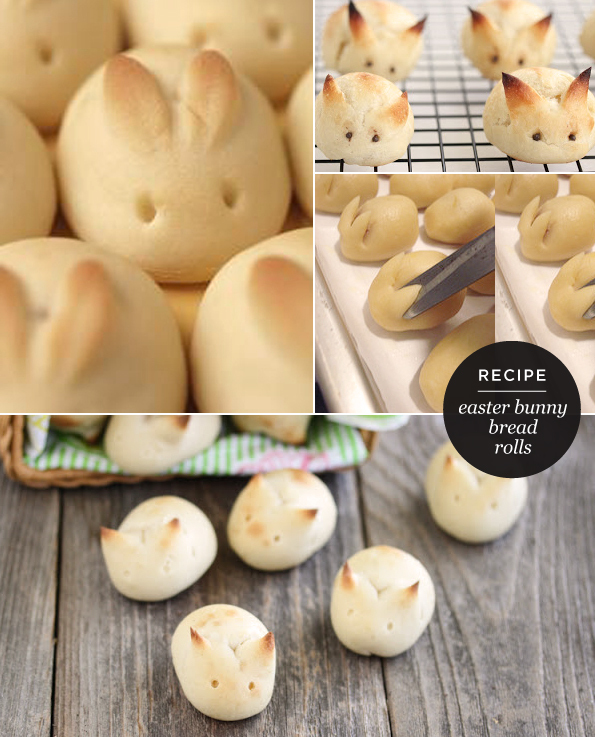 Don't you just adore these Easter bunny bread rolls? If you're feeling a little creative, you could serve these to add a little fun to the dinner table tonight! Here's an easy 10 minute baking time recipe by Kirbie's Cravings. 1. Put the butter, the sour cream and water in a small saucepan and heat, but do not cook. Cool to tepid then add the remaining ingredients. 2. Put in a kneader. If thick add more water. 3. Let it rise double and cut into 16 equal parts. 4. Use baking tray lined with baking paper and cut the ears with scissors. Make sure you smooth the edges around, so you do not end up with devil horns. The eyes can be poked in or use pepper grains. 5. Bake at 375° for about 10 minutes or until golden brown. Photos are from the lovely Kirbie's Cravings. Check out her other recipe, Honey bunny buns. Top, left image by the talented Ancika konyhája.